The California Economic Summit’s Elevate Rural CA initiative is a statewide collaborative committed to advancing the sustainable development of rural regions. We are asking people who live in rural California for their thoughts on what can be done to help advance the economic interests of their region. Editor's Note: This story was submitted before the most recent fires broke out in Northern and Southern California. I live in a tinderbox forest in the Sierra-Cascade foothills 30 miles east of Redding in Shasta County. The woods surrounding me, like most of California’s 33 million acres of forest, are so bone-dry and packed with underbrush that the slightest spark could set them ablaze. That’s precisely what happened on a 113-degree day this past July when a spark caused by the rim of a flat tire scraping on the asphalt ignited a wildfire in the Whiskeytown National Recreation Area west of Redding. Fueled by trees and dense underbrush and fanned by stiff gusts of wind, the Carr Fire roared into west Redding, jumped the Sacramento River and touched off a fire tornado that incinerated everything in its path. By the time firefighters established containment lines to protect the city’s 90,000 residents the next day, the Carr Fire had killed eight people and destroyed more than 1,000 homes. It continued to burn to the west and the north of the city for seven weeks before full containment was achieved, scorching nearly 230,000 acres of forest and wildland and filling the north end of the Sacramento Valley with thick, acrid smoke that blotted out the sun for days on end. But fire season wasn’t over yet—it still isn’t. Overlapping the Carr Fire, the Delta and Hirz fires north of Redding burned another 100,000 acres of forest. Approximately 100 miles south of Redding, the Ranch Fire (Mendocino Complex) consumed another 410,000 acres of wildland in Colusa, Glenn, Lake and Mendocino counties. The 2018 California wild fire season is expected to surpass the 1.4 million acres burned in 2017, which was the second most destructive wildfire season on state record. As of today, fires are fiercely burning in both Northern and Southern California. Eight out of the 10 largest fires on record in California have occurred since 2000. According to Anthony Leroy Westerling, a professor of management of complex systems at U.C. Merced, large wildfires in the region have been growing both in number and in the number of acres burned since 1980. There’s a reason for that. The fire season has lengthened in the western United States. In California, in the Sierra Nevada region, fire season was 65 days long in the 1970s. As successive springs came earlier and summers lasted longer, fire season was stretched out to 81 days in the 1980s, to 109 days in the 1990s and to 140 days in the 2000s. The warmer temperatures have also brought drought and bark beetles, which have killed 129 million trees in the Southern Sierra Nevada between 2010 and 2017, according to USDA Forest Service field data. An estimated 8.8 million acres of California’s 33 million acres of forest is affected by drought-related tree mortality. Today, Californians living in the wildland-urban interface—where open space meets the suburbs—or in the forest where we spend almost half the year living on pins and needles, in mortal fear of the next accidental spark, out-of-control transient campfire or lightning strike. The other half of the year, in my case at least, is spent cutting and burning brush when the red flag warning is turned off, which sometimes doesn’t happen until after the rain comes in February. If it comes. But there’s something more at stake here than individual lives and property. California’s forests are the state’s largest carbon sink and extract millions of metric tons of carbon from the atmosphere annually. Massive infernos like the Carr Fire emit carbon by the gigaton, both during the actual fire and later as the burned forest decomposes. That’s important to all Californians and indeed the world, as the rising level of anthropogenic (human-caused) carbon dioxide and other greenhouse gas emissions continues to jack up global temperatures. According to the latest report from the Intergovernmental Panel on Climate Change, things are about to get a lot hotter in the coming decades throughout the world, including northern California. It’s always been blistering hot in Shasta County in the summer, with multiple days-in-a-row in the hundreds, and there have always been wildfires. But as Westerling’s research demonstrates, the fire season is growing longer and hotter with more large fires throughout the western United States. The IPCC stresses that unless immediate action is taken to mitigate and adapt to climate change worldwide, we’re in danger of shooting past 1.5°C as early as 2030. It recommends nothing less than a dramatic overhaul of the way we conduct our business, from how we make our energy, to how we get around, to how we grow our food and, yes, to how we manage our forests. Such an ambitious project takes planning, and when it comes to California’s forests, the state, long a leader in climate change legislation, has a detailed plan. Called the California Forest Carbon Plan and released earlier this year, it calls for massive public and private investment to restore our forests to resilience before it’s literally too late. “California is blessed with 33 million acres of forestland and an urban forest canopy that together capture and clean our water supply, provide habitat for countless wildlife, cool our cities, support local economies, and serve as spiritual and cultural centers for indigenous and local communities across the state,” the plan states. About 17 million acres of the state’s 33 million acres of forestland are owned by National Forest System or the Bureau of Land Management. Private and state forestlands account for 13.5 million acres. More than half of the state’s forestland may be in need of treatment, including the removal of millions of beetle-infested dead trees in the southern Sierra Nevada and voluminous fuel loads packed throughout California’s forests caused by decades of fire suppression. In order to make an ecological difference on the landscape scale, CAL FIRE recommends increasing the state’s present treatment of 17,500 acres per year to 500,000 acres per year by 2030. The feds have pledged to treat an equal amount. 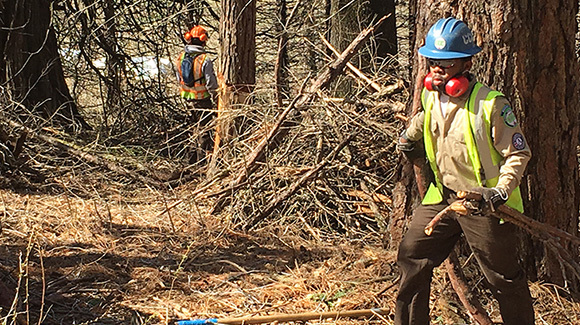 Treatment includes dead tree and forest residue removal through mechanical and hand thinning, as well as the increased use of prescribed fire and some sustainable logging where permitted. Dead trees and forest residue that are not marketable will be chipped and burned in biomass generation plants or burned in open slash piles in the field. It’s a massive undertaking involving scores of federal, state and local agencies and private businesses, including the timber, trucking and shipping industries. A study on removing the 129 million dead trees in the southern Sierra Nevada with existing infrastructure estimated it would take 100 years to complete the task. The Forest Carbon Plan is careful to point out that treating 500,000 acres per year is an “aspirational” goal. Under present estimated funding levels, it has set 35,000 acres per year by 2030 has a reachable mark. The plan also emphasizes that collaboration between all the stakeholders involved, including many who’ve often been at odds with each other, is key to the plan’s success. From where I’m sitting, here in a tinderbox forest with a basic knowledge of climate change science, cranking up the state’s forest treatment level to 500,000 acres per year as soon as possible makes perfect sense. It’s the only way to truly make a difference. It also means thousands of jobs—well-paying jobs—from the crews who will be performing the removal of dead trees and forest residue, to the professional administrators supervising a multitude of programs, to the engineers presently designing the next generation’s biomass energy facilities, which, if successful, will incorporate carbon capture and sequestration technology to create a negative carbon footprint by mid-century. But I know my neighbors. Shasta County is majority Republican, and according to a recent poll conducted by the Public Policy Institute of California, just 23 percent of the state’s Republicans believe California should be a world-leader in the effort to adapt to climate change, versus 67 percent of Democrats. In the veritable media desert that is rural northern California, conservative talk radio stations constantly broadcast climate change is a hoax, with almost no rebuttal. Moreover, rural California’s conservative residents are predisposed to reject any big government project, and the Forest Carbon Plan, if its aspirational goals are fully implemented, may turn out to be the most monumental government project in the state’s history. Even liberal urban voters, perhaps unaware of our forests’ importance as a carbon sink, could balk at the cost, which will easily run into the tens of billions of dollars over decades. There’s one ray of sunshine piercing through our future smoke-shrouded skies. Much like the California Economic Summit, both the IPCC and the California Forest Carbon Plan embrace the “triple bottom line” values of equity, prosperity and sustainability. Balancing those values between all the varying stakeholders involved won’t be easy, but it must be done if we’re going to adapt and survive this crisis. There is no other rational choice.